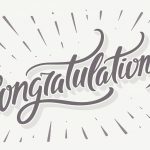 The Canadian Academic English Language Assessment- Computer Edition (CAEL CE) is designed to measure the English language proficiency of students planning to study in Canadian post-secondary institutions. The CAEL CE Test provides an authentic representation of language use in a Canadian academic context. As would be expected in a first-year Canadian university or college classroom, test takers read articles, listen to a lecture, answer questions, and write a short essay. Each test taker receives a score report showing their performance on each component as well as an overall score that is the unweighted average of the four individual component scores. CAEL CE scores are accepted by more than 170 post-secondary institutions in Canada as proof of the English language proficiency of applicants. 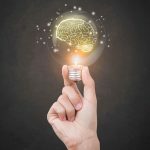 These institutions also accept other English language proficiency tests, and there are occasions when comparisons need to be made between scores on different tests. To help university admissions offices use CAEL CE scores to evaluate applicants, Paragon conducted score-comparison research between CAEL CE and an alternative test, the International English Language Testing System – Academic (IELTS – Academic). 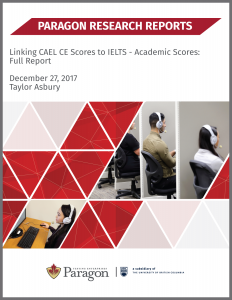 The aim of this research was to identify which IELTS – Academic component score(s) are comparable to each CAEL CE component score and which IELTS – Academic Overall score(s) are comparable to each CAEL CE Overall score. This was accomplished by what is known as score linking. The Method section provides more details about score linking as well as information about the dataset and the analyses. The Results section will present score comparisons for the four skill components and the overall scores. The final section, Discussion, considers the results in terms of their applicability to the test taking population as a whole, evaluates the limitations of the sample, and makes suggestions for future research.